Director of Quality Assurance, Cavendish University, Kampala, Uganda. Global Young Academy Connies Blog: Learn.Grow.Repeat. Education is essential for our future and for the future of our children. However, research shows that our education is far from perfect. So, how can we make it better? 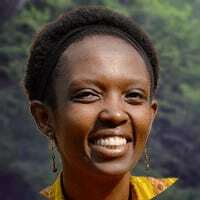 Connie Nshemereirwe measures the literacy and numeracy skills of students, with the aim of making sure that every child in Uganda has the opportunity to become liberated through education. She dreams that one day, all people will be able to decide who theyr are, and be proud of the path they have chosen. Connie: My name is Connie Nshemereirwe, and I teach at the Uganda Martyrs University in Nkozi. I work in the Faculty of the Built Environment and in the Faculty of Education as a dual appointment. My main research area is in Educational Measurement. Nerina: What are you working on right now? Connie: I am measuring the literacy and numeracy skills of university students; both those that are entering the university and those that are in their third year of university. So it’s a cross-sectional study and I’m trying to see if being at the university has an impact on the development of these skills. Nerina: What is the purpose of your research? Connie: The reason that I decided to specialize in educational research mainly is because I feel that the quality of our education is not often – we say it’s poor but we don’t really know what are the specifics of this quality are. So we just think oh we need more teachers, we need buildings or we need more of these but I find that it’s really critical to measure the skills that this education of ours gives us and to think about the skills that we want and see where the gap is. So Educational Measurement allows one to really measure the performance of their own system so that they can have a more targeted input rather than just guessing we need more of this or more of that. So that’s why I do educational measurement. Nerina: What did you find out? Connie: The main research that I have done in measurement of late has been at the university level and I’ve been measuring the skills of university students in their first and final year of university. Basically in literacy and numeracy using items from the PISA Survey, which is the Programme for International Student Assessment and the thing which surprised me in my findings, was that the university students in some items performed worse than the average 15-year old in the PISA Survey. Worse still that the items on which they performed worse these are the items that require higher order skills. On the other hand though, it confirms what other researchers have found that if the foundational skills are not well developed then high-level skills are going to be difficult to develop. So the university students can do very well in items in numeracy and literacy that require lower order skills but really struggle with items that require higher order skills. Which is really surprising because the students who are at the university are the best students in the country. They are the ones who can get to university. So what does that tell us about all the other students that drop out or that don’t go that far? That’s rather worrying I think. Nerina: But the problem starts actually at school. There is a UNESCO report from 2015 that says that there are children who have been in school for three years who are not able to write and read. Why? Connie: It’s quite true. I’ve actually been at a school where I have met children who have been in school for three years and they cannot read a word like “ball” or you know really simple words and I think the problems are several. One is that the children who are enrolled in the first few years of school are a lot, the classes are really large and to teach such foundational skills, on literacy and numeracy, to a class of 90 or 100 is nearly impossible for one teacher. And further, a lot of these children are in rural areas where they may not have ever come across English. Some do not have any books at home, some have never even written the letter A or B, some do not go to preprimary school, they don’t go to kindergarten and they don’t have access to these kinds of schools. So when they arrive in the first year of primary school it’s a lot to learn and the teacher cannot really give each student enough attention. Yeah, it’s possible for them to come to school all these years and never learn how to read and the problem really continues through the education system because the emphasis on learning how to read and on counting and so on actually stops as they go to the fourth year of primary school and fifth year of primary school. They end up just sort of learning somehow and not learning properly. So yes that’s part of the problem. Nerina: If you had the possibility what would you change tomorrow? Connie: If money was not a problem and if time was not a problem, if everything could happen in an instant I would have much better trained teachers, at least graduate teachers in every primary school, that’s one. Two, I would have new books produced that depict the normal situation of children in Uganda. I find that a lot of books that are available for children to learn how to read depict situations that are foreign to them. So they show children bouncing a ball and a lot of rural children have never seen a ball bouncing or they depict children riding a pony or whatever it is. I mean they are really inappropriate. So straight away I would want to have books that teach how to read, that depict the daily situations of the children especially in the rural areas because that’s where the majority of children are. Immediately, I would also have teachers of a quality of at least a university graduate in every primary school. I think for me this would be the biggest improvement at this moment. Connie: The thing that motivates me is that I really believe that education liberates. Education can liberate someone. For me a good education or the purpose of education is to create a liberated person. To create a person who thinks about things themselves, who is critical, who feels able to transform their own reality and to choose their reality. So education plays a very big role. If we can have an education that is purposeful in liberating people, in giving them the skills to be who they are and to participate in society. I think this has a very big role to play in creating a society that is proud, that choses who to become and is proud of who they are. So the thing that really motivates me to continue doing educational research and to make sure that every child has the opportunity to really become educated is so they can be liberated, so they can be free, so they can do what they feel like, when they feel like. Nerina: What drives you in life? Connie: The thing that drives me in life generally is something that has been driving me for the last 15 years or so and that is the possibility to become what I can become or who I should become. Along the way I’ve really been very careful always to look inside and think who are you? What are your skills, what are your capabilities, how do you feel about things in the world and how do you change the world or your life to become more of who you are? At some point it actually was a bit difficult to embrace this because I felt that I could be really excellent, I could be really be a leader for instance, but then I felt like on the other hand why should I be the person in front saying things that are not popular for instance or being the first person to point out this or the other. But I thought no. I should really be who I am and do what I should do and this is the thing that drives me really to become who I am or who I should be. Connie: Who is Connie? Of late I have begun to identify as a leader, as a person who stands up for what is right, as a person who speaks without fear about something that is not going right or a person who goes… Because sometimes you are in a situation where everyone is afraid to say what’s going on or be the first to point out something that’s wrong and these days I’ve decided as a leader I should always be the first to do it and it’s always in very small ways. I mean if the room is too warm if we’re in a conference I’m the one who will go and say, “Hey, the room too warm. Cool it down a little bit.” Small things like those, but also if something is not going right in the government or the country I will write to the newspaper and says something or if at the university they bring up a policy that I think is not very well thought out I will send an email about it. Of late I’ve really begun to identify as a leader. Nerina: What does a leader do? Connie: That’s a very good question. I used to think that a leader is the person who has the power or the influence. A leader can have influence but then it’s not an issue of power it’s an issue of relationship. If you can persuade another person to see things a certain way or to think about things and make up their mind about it I think that’s what a leader does. You spread the truth around you, you build relationships, and you participate in society actively. I think that’s what a leader does and that’s what I try to do. Nerina: Do you have a dream or is there something that you dream of for the future? Connie: Yes. I do have a dream for the future. I really dream of Ugandans specifically but Africans generally as a people that can come to decide who they are, be proud of who they are and chose to become. Rather than I feel that we don’t have a very clear vision of what we should be or we don’t feel very comfortable in the world. We feel a little bit behind, a little bit inferior, we don’t appreciate ourselves, we don’t appreciate our culture, and we don’t appreciate our skills. For me the dream is to see Ugandans and African in general as people who are proud, who know who they are and are proud of it and chose to become who they are. So for me that… I don’t know if it’s a very clear dream or sought of a very… [signals with hands vagueness]. Nerina: It’s a beautiful dream. Connie: Okay that’s the dream. Connie: Yes, what kind of society do I dream of? I’ve recently been reading the work of a philosopher called Paulo Freire who is a Brazilian and he says that the vocation of humans is to become and that any system that prevents a human being from becoming who they are is an oppressive system. So the society that I really dream of is a society where everyone has the opportunity to become who they are: to be a gymnast if they want to be a gymnast, to be a musician if they want to be a musician, to be an artist if they want to be an artist, and to be a mother if they want to be a mother. So a society that creates the environment where everyone can become who they are for me would be the ideal society. Nerina: Thank you so much, Connie.